Bartlett On Bass: SASS.... It's THE SPAR @ 7....WOW..Look at Those Musicians Go! SASS.... It's THE SPAR @ 7....WOW..Look at Those Musicians Go! 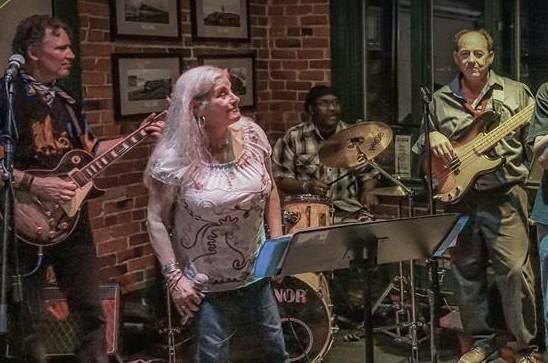 BUT, folks let's get real here....these are old guys and a gal....O.K., let's just say it....Old Hippies doin ALL of this fun music.....That's just plain amazing, isn't it? SHELL said she was getting tired last night....and, Steve and I are taking a nap before the gig...what??? yep, it's all true....sorry to have to break that sad news to ya. But, what 'bout all those good old days of...you know....'ah'....protesting, singing and marching to change the world and stuff like that? DONNO... Well,.... I just know....'I'm looking forward to naptime this afternoon, that's all. So, let list these cool...';we can do anything kinda musicians.'. Let;s see....hum...there's that gal....you remember....the very cool BLUZZZY one....'ah' she sings in the middle front....you know...oh yeah.....Ms SHELLY ELY/vocals,and then that cool guitar dude....you remember...'ah'...yeah...I got it.....'ah'...it's STEVE MERRIAM.guitar/vocals....he writes c ool songs too...I almost forgot that....then, that black guy in back....'ah...../ANDRE THOMAS/drums/vocals...he plays really good. Now, this last guy should be really EASY to remember right?...I know....it's right on the tip of my tongue....'ah'....he's snoring right over there in his chair...I better hurry looks like naptime is starting already...what is his name?...Oh yeah...that's my husband, isn't it?...I know...let's put a bass guitar in his hands just to make sure. O.K?...yeah, I was right....that's STEVE BARTLETT.....he plays bass and sings with SASS.....cool.